The 22-year-old model Hailey Baldwin in a beige jacket visits the hair salon in LA. 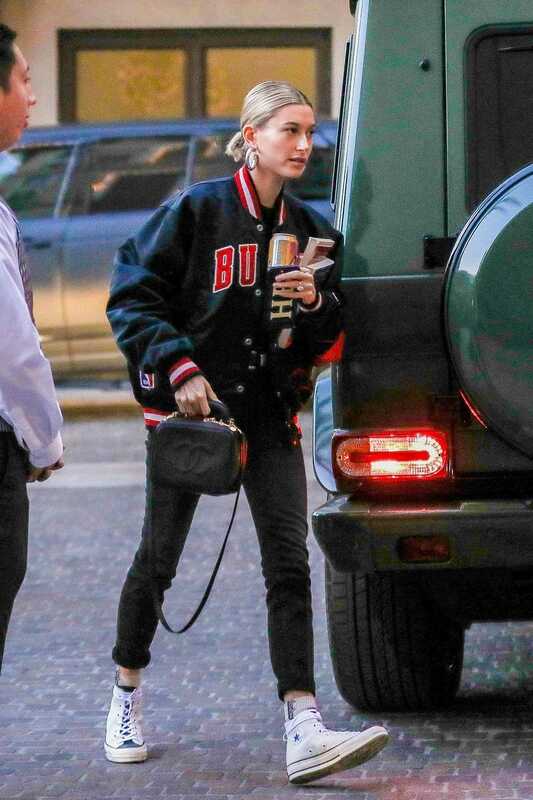 The 22-year-old model Hailey Baldwin, who married to Canadian singer-songwriter Justin Bieber on November 23, 2018, in a black long sleeves T-shirt arrives at Joan’s on Third in LA. The 22-year-old model Hailey Baldwin in a gray coat was seen out in Studio City. The 22-year-old model Hailey Baldwin, who has over 13 million followers on Instagram, in a plaid coat arrives to the Nine Zero One hair salon in West Hollywood. The 22-year-old model Hailey Baldwin in a brown plaid coat leaves Barnes and Noble with Justin Bieber in Los Angeles. The 22-year-old model Hailey Baldwin, whos uncle is actor Alec Baldwin, in a blue denim shirt heads for lunch in West Hollywood. The 22-year-old model Hailey Baldwin in a white Converse gumshoes returns to the Montage Hotel in Beverly Hills. The 22-year-old model Hailey Baldwin, who got engaged to Justin Bieber in July of 2018 and the two secretly wed two months later, in a blue blazer goes shopping in Beverly Hills. The 22-year-old model Hailey Baldwin in a gray sweatpants was seen out in Beverly Hills. The 21-year-old model Hailey Baldwin, who has over 13 million followers on Instagram, in a beige trench coat leaves her apartment in NYC.